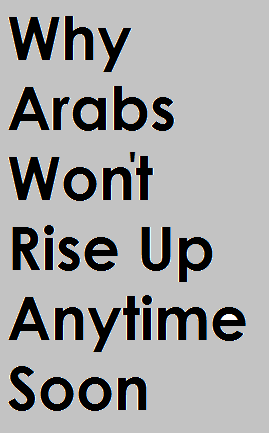 Here’s how I see things mate, It’s not about having all arabs rise up soon. I don’t care to achieve that goal. Rather, I’d prefer to have a bunch to rise up soon. Have those succeed and give back, creating the next bigger batch of risers. Eventually, the rest will follow. I believe there is a hero in everyone of us. I wana start the movement, but I can’t do it on my own! Together, we can make it. Divided we fail! Your response reconfirms what I mentioned in my post. We create individual starts, not a system and a whole nation. Your effort and initiative are plausible and a sign of innovation and drive, yet it is still individualistic and short term. Creating 1000 heros doesn’t make an army, they remain 1000 individuals. I agree with most of what you said and I believe change starts at schools and in our educational system. Community service is one thing the IB program emphasizes and many schools are implementing. Also, If family members start educating their children and teaching them values of cooperation, unity, equality, honesty things will start changing. Be hopeful that the new generation will succeed in bringing this change, we all have to pitch in though and put the effort to keep educating them. I really liked the article, but if you change the title to a more positive one, I think it would be better. That is my only comment. In your basic assumption you mentioned: “If you observe how nations grew into world powers you will realize that most of them have two main factors in common: Institutionalization and care for public good.”, can you please provide examples and elaborate more on this issue? I do not agree with this assumption, most nations grew with a dictator teaching them public good and love for their identity, both of which can be argued since the term Arab is a bit vague and is not always identified as a nation (versus other nations mentioned as the Chinese). Excellent article, though I think of this every hour of every day but I hope that one day our nation can start thinking of the group and individual interest at the same time and then will have a different identity, invincible one.